Slide your finger inward from the screen’s top or bottom edges. As you slide your finger, the App bar comes into view, snapping along the screen’s top or bottom edges. The address bar also doubles as a Search box. Type a few keywords and press Enter, and Microsoft’s Bing search engine lists websites matching your search. Cancel/Refresh: As you view a site, this is a Refresh icon; tap it to reload the page, retrieving the latest details. While a web page loads, this icon becomes a Cancel button; if the site loads slowly, tap the Cancel icon to stop trying to load the sluggish site. Favorite: Tap this icon, and a list of sites you’ve marked as Favorites appears above the address bar. This makes them much easier to launch from within the browser. Add to Favorites: Displayed when viewing your Favorites list, this icon lets you add your currently viewed site to your Favorites list. Pin to Start: Seen when viewing your Favorites list, this icon places a shortcut tile on the Start screen that launches your currently viewed site. Share: Displayed when viewing your Favorites list, this icon opens the Charms bar’s Share icon, where you can share the site with others, place it on your Reading List app, post to social networks, or e-mail the site to friends. Tabs: Tap this icon to replace the Favorites list with a view of your currently open tabs. Forward arrow: After clicking the Back arrow to revisit a site, click the Forward arrow to return to the site you just left. Tab Menu: Displayed when viewing a list of your currently open tabs, this icon brings a pop-up menu with two options: Close tabs, which closes all the open tabs, and New InPrivate tab, which opens a new tab for browsing in private (covered in the “Browsing in private” sidebar). The Start screen browser may look lightweight, but it provides everything you need for casual browsing. 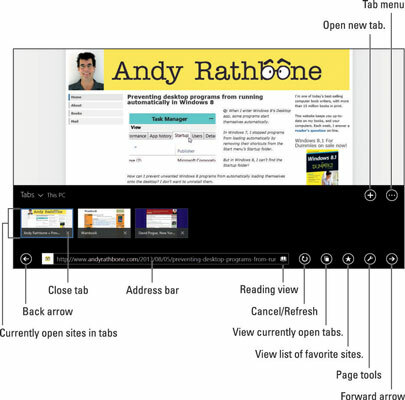 The browser lets you open several sites simultaneously, each in its own tab.